With the recent mix-up that happened on the prestigious pageant, former owner and current US presidential candidate Donald Trump gave his opinion on the said event. He posted that it is going to be cool if both Miss Colombia Ariana Gutierrez Arevalo and Miss Philippines Pia Alonso Wurtzbach to become co-winners. He also tweeted that if he is still the owner of the beauty pageant, the mistake will never exists. During his recent interview on NBC network's "The Today Show", he soften a bit by admiring the hosts Steven Harvey for admitting his mistake and he is a great guy. He then added to expect the unexpected during a live telecast. During the pageant, Harvey declared Miss Colombia as the new Miss Universe but after a few minutes, he returned to the stage and apologized to the crowd that the real winner is Miss Philippines. Hours after the pageant, he took to his twitter account his apologies to Miss Colombia and Miss Philippines for his huge mistake . He also personally apologized to Wurtzbach at the press conference of Miss Universe and the Filipino beauty forgiven him. Harvey is a comedian and a host of the game show “ family feud “. 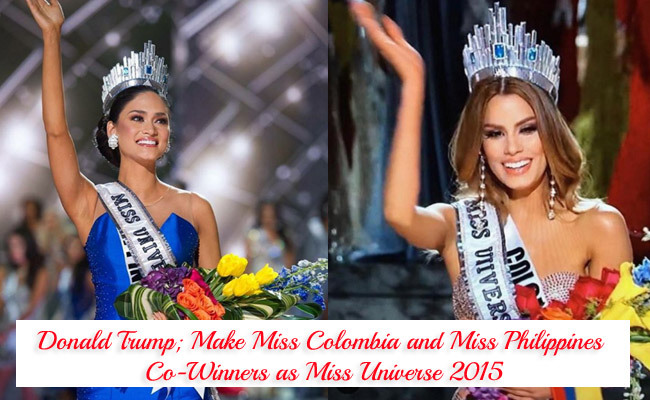 Even he did a mistake, the Miss Universe Organization still offered him to host the pageant next year. The tough talking businessman co-owned the organization of Miss Universe along with NBC Universal until he planned to run for president early this year but he offended a lot of Latin's last June during his speech. These made Uni vision, a Spanish-language network to cut ties with the businessman for the first time in five years and NBC also threatened to pull out their connection with Trump. Their actions made Trump sue the two networks until NBC settled with him last September. Trump is currently busy with his campaign in running for president of America as a republican.